The much famed multiple seasons of 'Kalakka Povathu Yaaru' was a unique attempt by Vijay TV as it showcased innumerable talents in the field of comedy and humor for its viewers to enjoy and relish. Moreover, the show has been a springboard for many aspiring youngsters who have never faced an audience or even had a stage performance. For them, it has been a remarkable turn as they have got their break into the film world by means of this popular show. 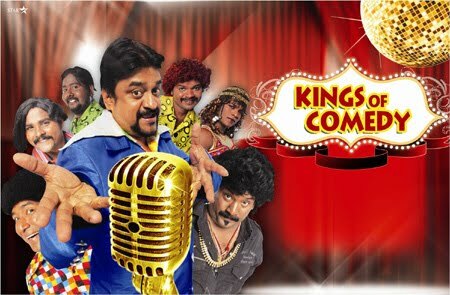 Continuing its stride of success Vijay TV now launches yet an other comedy genre titled 'Kings of Comedy' from 03 June 2011 airing every Friday at 10 pm. In this war of the comedians, six teams, each comprising of two popular faces in comedy including a 'gana' singer will battle it out for the title. Kings of Comedy will be an all new line up of comedic talent at its best. There are a lot of talented artistes everywhere and Vijay TV aims to recognize them and provide a platform to express themselves. The judges for this show would be actor Chinni Jayanth and Gnanasampantham. Many segments like 'stand up comedy', 'spoof of a famous scene', funny game involving the teams', skit by the mimicry artistes', 'gana songs' will feature on this comedy show. Behold! Extravagant sets, amazing grand prizes, attraction unlimited, larger than life, talents extraordinaire, a show that salutes the true spirit of comedy…bigger and better…that's 'Kings of Comedy' coming your way on 3rd June, Friday at 10 pm. Don't miss it!